My family came to India with Malik Hayder Ghazi, who laid the foundation of Bassi, on the outskirts of Sirhind City during the reign of Sher Shah Suri. 12 Tumans (Zais) came here, but many have become extinct and a few are left now. Their chief source was and is either agriculture or service. Some of them used to serve in Hyderabad Deccan even in pre mutiny days.The Afghans used to enjoy semi-independence till the cessation of Bassi to Patiala State and chose their own rulers. When the Moghul rule was nearing its end, the Afghans of Bassi were unable to defend themselves and they began to search for a Ruler who could defend them from the Sikh Invasion. Nawab Shamshair Khan Killewalla (Bassi), backed with the majority of Bassi Afghans, brought an Ahluwalia Family related to the Maharaja of Kapurthala, to rule in Bassi, while two families of Omarzai Afghans sided with Patiala. They on their own accord brought a Patiala Tahsildar to Bassi, against the wishes of the rest of Afghan community. The result was that the then reigning power began to torture them, their houses were looted and burnt, and men imprisoned (our Omar Zai ancestors). More than once Patiala Forces were sent to help against Kapurthala Forces. These two families were of Nijabat Khan (Muqueem Bhai’s ancestors in Katehra Mohalla across town from ours in Mohalla Nai Sarai and Ghous Khan (our ancestors)of Nai Sarai. When Rani Jounsa died, Kapurthala Forces took possession of Bassi, but these two families never yielded to them and kept on agitation against them in favour of Patiala. The leading members of those families at that time were Nijabat Khan and Ghous Khan’s two sons Shah Mohammad and Bhikan Khan Sahib. The result of this Civil War was that British Govt. took possession of Bassi, which was made a part of Ludhiana District. The activities of these two families continued, with the result that the British Govt. after ten months rule handed over Bassi to Patiala. It was the day rejoicing for these two families, and their services were rewarded by Patiala in more than one way. Muafi of land revenues were given to them. They were considered to be the Malikan-i-Ala of the whole Bassi. The lands of the rest of Afghans siding with Kapurthala were confiscated. During the short British rule, Arain cultivators of Bassi wanted to take the advantage of the situation and to assert their own rights against Landlords. His Highness’s Government was so much pleased by the services rendered by these families, that the orders were issued by the Foreign Office, under the August Commands of His Highness The Maharaja Narinder Singh Sahib Bahadur, to the State Vakil at Ludhiana and to Tahsildar Fatehgarh Sahib to help our private cause with the British Officers. A copy of the order, which happens to be with me by chance is attached herewith. The words Zubdatul-Iqran have been used with when the name of Bhikan Khan Sahib was mentioned in the Perwana. The words show the esteem in which he was held. As the fortress of Bassi and other public buildings were in the possession of Kapurthala side and Patiala had no State building, in the city, the necessity was felt to have one to show British Officials that Patiala has got substantial proof of possession even in the city. The building of Nizamat, Bassi was built in one night by these Afghans. This was the reason for naming it as Shatab Garh. These families used to collect revenue for Patiala and render every sort of help to them. For instance when General Octorloney was passing through Patiala territory, orders were sent to Nijabat Khan to help in every way with Rasad, etc. A Perwana-i-Khushnudi was given by the General for the help given. (Perhaps Muqueem Bhai had this, he once mentioned it. These Afghan used to fight battles for Patiala with their Retainers; just like Feudal Lords in England, and many lost their lives in them. 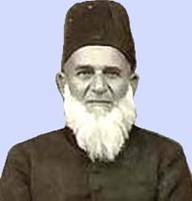 Bhikan Khan Sahib had two sons, both entered the State Service. The elder Kalay Khan Sahib entered the service as Daftari and retired as Nazim. The younger Namdar Khan Sahib was recruited in the army and worked as Naib Daftari, in Bhakshi Khana. Later on he was sent to Thanessar District as Vakil. His services during the Mutiny and his honesty brought him into the notice of His Highness Maharaja Narinder Singh Bahadur, who made him Naib Adalti on the reduction of Thanessar District. His Highness The Maharaja Mohinder Singh Bahadur made him Sarishtadar Ijlas Khas. Afterward he was made Nazim and later on he was made Adalti (Judge). During the minority of Late-Lamented His Highness the Maharaja Rajinder Singh Sahib Mohinder Bahadur, he worked as a Member of the Regency Council. The work of the Council is so well known and so highly spoken, that I need not write any thing on the subject. S.H.Ashraf Khan Sahib son of Ch. Namdar Khansahib, entered the State Service at an early age. He worked in different capacities. He was a Musahib (Advisor) to His Highness The Maharaja Rajinder Singh Sahib Mohinder Bahadur. He retired from the service as Nazim after 47 years of service, which has been well appreciated by our August Master in the order of his retirement. He graduated from M.A.O. College, Aligarh and studied Law for 2 years. He joined the Patiala State Service as a Naib Nazim (E.A.C.) and in due course was invested with the powers of a Sec. 30 Magistrate. Latter on, he became an A.D.M. and for five years worked as Nazim(D.C.). When the Judiciary was separated from the Executive, he was appointed District and Session Judge, Bhatinda, from which post he was promoted to the post of Judge in the High Court. He was then made Home Minister and later on was given the portfolio of the Ministry of Development and Agriculture. He retired on superannuation pension, after having been given two extensions, on 16th December, 1944. Bhikan Khan’s family were known for their honesty, piety and hard work. It was honesty of Cn Namdar Khan that he rose to become Judge. He in one case he gave decision against the wish of Maharaja Mahinder Singh who then sacked him. As the luck would have it, Ch Namdar Khan was appointed by British Govt as the Muslim Member of the Regency Council during the minority of same Mahinder Singh’s minor son Rajinder Singh.